Hello beauties! Today I have for you a comparison post for some eye dusts! 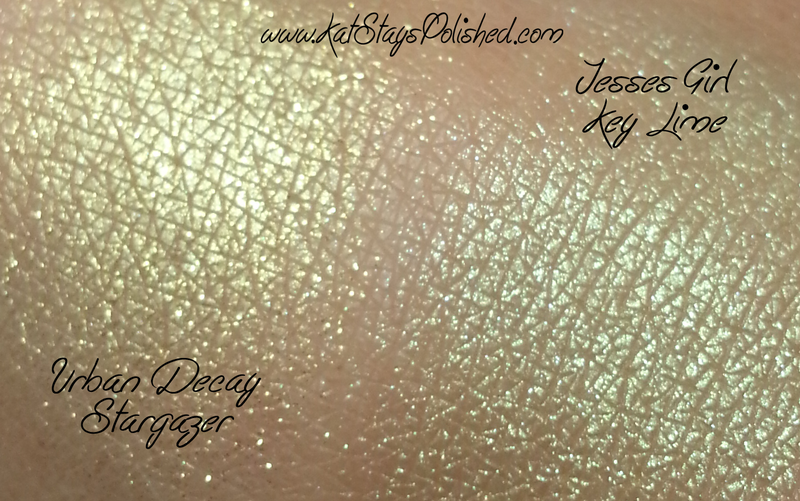 Recently I recieved an Urban Decay Moondust as a bonus in my May Ipsy bag. I got the Stargazer color and these retail for $20 normally. 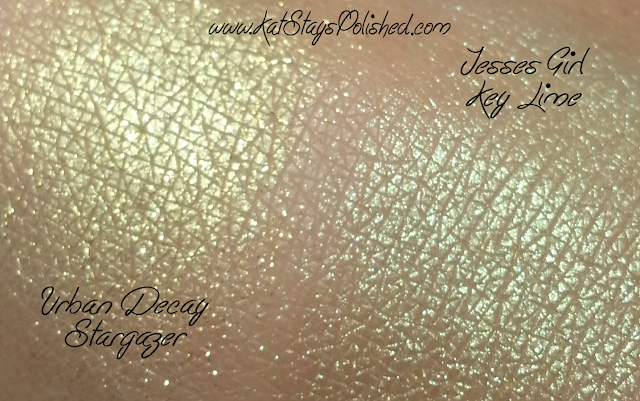 The description off of Urban Decay's website says this color is a "metallic lime-gold w/gold 3-D sparkle." As soon as I saw the word lime I immediately thought of my Jesse's Girl Pure Pigment Eye Dust in the color Key Lime, which retails for $4.99. It was then when I decided I NEEDED to do a comparison post to see just how similar these two colors were. The pictures are pretty much self explanatory. They are SO close to each other. 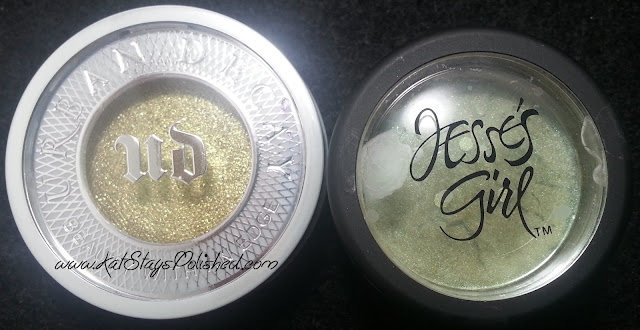 The only huge difference is that the UD color has more of a silver shimmer to it. In my opinion, if you already have the JG Eye Dusts, just add a little bit of silver shadow underneath of it and you're set! If you're looking for a compact pressed shadow, then UD is for you. If you like playing with pigments and loose powder, then JG is for you. Are they close enough in color for you to save $15 or do you just HAVE to have the Urban Decay? where did you get the Jesse's Girl eyeshadow? It's gorgeous!